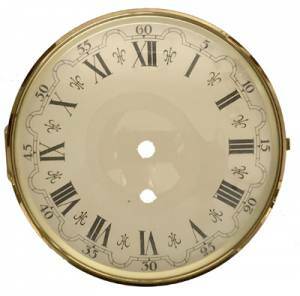 Diamond cut brass hinged bezel with latch measures 7" edge-to-edge diameter. Convex glass covers beautifully screened ivory roman dial. Ready to install. 10mm (3/8") drilled center hole measures 1-1/4” center-to-center from winding arbor hole. While supplies last. Made in West Germany. Regularly $45.00.